Whether you need your AC inspected or are experiencing a cooling emergency, our highly trained technicians will take care of your needs. You can count on the experts at Kayl Heating & Air. We offer a broad range of heating services to fulfill all of your indoor comfort needs. 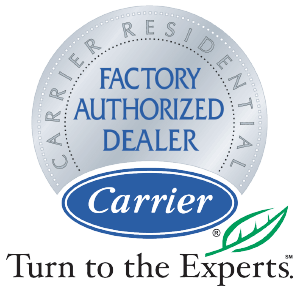 With a wide variety of products to choose from, let the Carrier experts help you customize a solution that’s right for you. When you need services for your total home comfort equipment, you can do no better than calling Kayl Heating & Air! Our technicians are NATE (North American Technician Excellence) certified, which validates their high level of expertise as heating and air professionals. They’ve developed their skills through hard work and determination, enabling them to take pride in their capabilities. Our service techs are the backbone of our great company, and we are proud of their ability to restore the indoor comfort of our customers’ homes and businesses. Let it also be known that we have won Carrier’s Presidents Award. 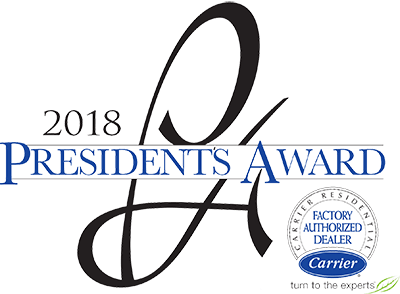 This is the highest dealer honor award recognized by Carrier for dealers who exemplify leadership and management, customer satisfaction, expertise, business growth and operational excellence. No matter how large or small the problem is with your HVAC system, we have a solution. We proudly serve the Greater Tri-Cities and surrounding areas. This includes Doniphan, Grand Island, Hastings, Kearney, and more! Whether you are in need of HVAC installation, maintenance, or repair, call Kayl Heating & Air today! Our experts can take care of it all! We’ve got you covered whether you need a first-time installation, annual maintenance, suggestions for optimal performance, or replacement parts. From heater repair to cooling solutions, we have the products you trust, from a company you can depend on. If you notice one of these problems or something that isn’t listed, please contact us! If you are looking for the best AC service Tri Cities has to offer, contact us right away. Each one of our technicians is handpicked from a pool of qualified applicants and chosen for their abilities and high level of expertise and experience. We trust in their skills and knowledge one hundred percent! Please allow us to show you what our cooling specialists can do for you. Give us a call for a free consultation or arrange for an appointment to give your system a tune-up or troubleshoot a problematic issue that you are having with your AC unit.